Flask Sandals by Reef… Flip Flops With A Built-In Flask! You better hurry and get these sandals while you can! Word is…you may be required to show ID to purchase these one-of-a-kind sandals in the near future. 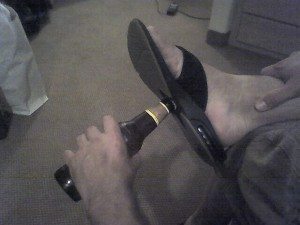 Because these flip flop are made with a built-in flask that holds 3 ounces of liquid beverage — per pair. That measures out to about 4 shots worth of your favorite adult beverage! These one-of-a-kind Reef Sandals are becoming all the rage on college campuses, among other places. As an interesting twist… many people are using them to sneak booze into events! Think about it, just pour an ounce or two of vodka, walk around with a can of Red Bull and no one suspects a thing! With these sandals, you’ve just got to talk a couple of friends into wearing a pair of bottle-opener flip flops (which I’ve talked about before)… and you got a party on the go! Reef “Stash” Sandals — these nifty flip flops allow you to tote around a spare key, money, etc. in the heel of the sandal! All About Flip Flops — who knew there were so many shapes, styles, and colors? !